Dental implants are modern dentistry's best option for replacing missing teeth. They offer a highly successful, long-lasting, and totally natural-looking substitute that actually becomes part of the jawbone and helps maintain its health. The reason is that the titanium of which dental implants are made has the unique ability to fuse or “osseo-inegrate” with living bone. This osteophilic (“osseo” – bone; “philic” – loving) property was discovered accidentally by a Swedish orthopedic surgeon in 1952. Much research and testing of potential medical uses followed, until the first dental implants became available for clinical use in the 1970s. Many improvements have been made since. There are now more than 40 different types of dental implants, and millions of people worldwide have a better quality of life because of them. In order to understand exactly what an implant is, you first have to picture a natural tooth, which essentially has two main parts: 1. the crown, which is the part you see in the mouth above the gum line, and 2. the root, which is inside the bone. 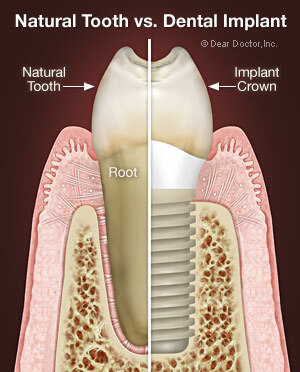 A dental or endosseous implant (“endo” – inside; “osseous” – bone) replaces just the root part of the missing tooth. The implant is then topped by a realistic-looking dental crown. Can you describe the Dental Implant Procedure? Dental implant surgery is usually carried out under local anesthesia (numbing the area where the implant is to be placed) and is a relatively comfortable procedure. Some minor vibration is generally experienced during preparation of the implant (bone) site, but it is quite tolerable. Since there are no open wounds following implant surgery and it is minimally invasive, there is little post-operative discomfort. A single implant usually needs to be left for a period of two to four months to fuse to the bone before a crown can be attached. The healing time depends upon the bone density at the site of the lost tooth; the more dense the bone, the quicker the integration. Following successful integration, your dentist will make a crown to fit on the implant that will look and function exactly like a normal tooth. In some implant procedures, the implant is inserted into the bone, covered with the gum tissue, and left to integrate or fuse to the bone. In this two-stage procedure, the implant is uncovered (stage two) and a small connector called an “abutment” is attached to the implant allowing the gum tissue to heal around it. Immediately or after a short healing period, a crown can be attached to the abutment. In a one-stage system, the implant is left exposed at surgery, slightly protruding through the gum tissue. Both of these systems have their merits and indications. That's not something you can determine for yourself. You'll need to have a complete exam so that your dentist can see how much bone volume and density you have in the area of the missing tooth, since a certain amount of bone is needed to support an implant. But even if your bone is deficient, simple bone regeneration techniques that have been used successfully for years can usually improve the health of your tooth-supporting bone enough to make you a candidate for implants. What are the Treatment Options for Dental Implants? Single tooth replacements: one implant and one crown replace a single tooth. Multiple tooth replacements: multiple missing teeth can be replaced with multiple implants supporting fixed bridgework. For example, a three-unit bridge to replace three teeth in a row will be comprised of two implants and three crowns; or multiple implants can support an even greater number of false teeth. Usually four to eight implants are needed to replace a full arch (jaw) of teeth (10 or more crowns) using fixed bridgework. Combinations of fixed and removable bridgework: implants support a section of fixed bridgework, to which a removable section is attached. Over-dentures: where two or more implants provide stabilization of a denture (set of removable false teeth). Over-dentures are now considered the standard of care for those who have lost all of their teeth in one or both jaws. Anchorage for tooth movement (orthodontics): temporary implants can serve as very stable anchor units for orthodontic devices to allow quicker and easier tooth movement. Temporary bridgework: micro-mini implants can be used to support bridgework temporarily while permanent implants are healing so that at no time will a person be without teeth. What Care is Needed Following Dental Implant Placement? The good news is that dental implants require no more attention than your natural teeth — except they will never decay or have any root canal problems. The only real concern is gum disease or too much stress applied to the implants through clenching or bruxing (teeth grinding) habits. Avoiding gum disease requires flossing and brushing your teeth on a daily basis, along with regular professional cleanings every three or four months to keep the gum tissues surrounding your implants healthy. If you have a grinding or clenching habit, you should wear a nightguard to protect your implants and your investment. Other than that, your dentist will exam your implants periodically to make sure everything is healthy and stable and will last a very long time. How Does General Health Influence Dental Implants? Certain health conditions and habits can have a bearing on the success of dental implants. For example, if you have uncontrolled diabetes, your ability to heal in general will be adversely affected. This in turn affects the osseo-integration process by which your dental implants attach to your bone tissue. Smoking reduces blood supply for healing, so surgical healing in general is less than optimal in a smoker (though smoking does not disqualify you from receiving implants). The osteoporosis drug Fosamax, if taken for more than three years, can compromise bone healing. Osteoporosis itself can affect bone density, making it difficult for implants to be strong enough to handle the normal functional stresses associated with biting and chewing, for example. Although it is rare, an implant can fail to fuse to the bone properly or it can come loose from it for a variety of reasons. Failure to remove food particles and plaque from the gums near the implant on a daily basis can lead to a bacterial infection known as peri-implantitis (“peri” – around; “implantitis” – inflammation of the tissues surrounding implants). This infection can destroy bone and loosen the implant. Sometimes it's the number of implants that's at fault: too few implants are placed to handle too much stress — a situation known as overload. Sometimes an implant-supported tooth can stick up a little higher than the other teeth, meaning it will be subject to more biting and chewing force. This is why it's so important to choose a qualified professional to install your implants. Can Periodontal (Gum) Disease Influence Dental Implants? As with peri-implantitis, gum disease is a bacterial infection that can result in bone loss. And continued bone loss can cause implants to fail. You may be more susceptible to gum disease if you are diabetic, pregnant or taking birth control pills. Whom Should I See For Dental Implants? Implants are normally placed by dental surgical specialists (periodontists and oral surgeons) or general dentists who have undertaken special training in implantology. Your general dentist is the place to start. Some general dentists have more knowledge than others in the field of implant dentistry, depending on their individual interests, knowledge and expertise. If he or she does not have sufficient expertise or training, you will be referred to a surgical specialist to place the implants and your general dentist will place the crowns that will go on top of the dental implants. This exemplifies the concept of a team approach to restoring your health. Find a Cosmetic Dentist today that offers dental implants or learn more about Cosmetic Dentistry.